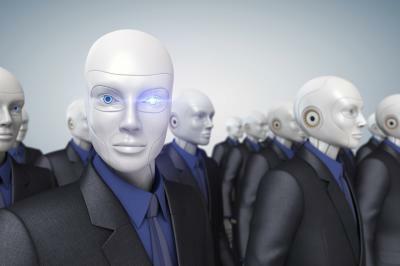 Community bankers should note that robots can now form teams. Researchers worked on a solution to give robots not only a central-processing unit to problem-solve, but also censors that allow one machine to take over leadership for a team of robots to work together. Doing so gives the team flexibility in that if one breaks down, the others can still continue on. There are many potential applications for this technology, from business logistics to military operations. While we don't necessarily think a bank board comprised solely of robots would make much sense, some bankers we know might say something else if asked. Speaking of bank boards, sometimes they can provide unforeseen challenges if they act too robotically. Humans are and should not always be predictable. For many CEOs, doing a great job helping to choose members of your bank's board of directors is critical. That said, people and circumstances can change. For example, a director might have an ongoing conflict of interest that can't be reconciled. Maybe a director has failed in his or her fiduciary duties, crossed some ethical boundary, or been ineffective or unable to participate in board discussions or committee assignments. Maybe they haven't played well with others or maybe they are just retiring. No matter the circumstance, it can be an uncomfortable decision and process when moves are made to rectify such issues. There are a variety of ways to dismiss a board member. If the problem is still a theoretical one though, your bank might set term limits for directors. Many corporations use rotating terms for directors, so that at least one director leaves the board every year or every few years. In such cases, board members might have an initial 3Y term, followed by the possibility of two 3Y reappointments. If things work out well, the director stays for nine years. If not, the director exits at the end of one of those 3Y terms. This structure is both good and bad depending on the situation and the bank, so only you can decide. Consider what to do if a board member's issues are temporary. This can lead to a leave of absence as a possibility, but it may also not be required. Here again, the bank should look at its own circumstances to decide. One of the most difficult conversations occurs when directors must intervene directly to resolve an issue. Here, talk to the director in question perhaps and explain that it is in everyone's best interest for that person to leave the board. Offer a leave of absence (with no return date) as a face-saving option perhaps, but be clear that this person's role as a director has come to an end. The board chairperson, the chief executive, and the board attorney should be part of that conversation. Impeachment is an ugly last resort. Bank bylaws should spell out the reasons for formally removing a board member: conflict of interest, failure to fulfill duties, or egregiously bad behavior for example. Then, rules typically require a two-thirds vote for a director's involuntary removal. It goes without saying that this situation is one that no bank wants. However, when it arises, knowing how best to handle it with the least amount of business disruption is important. Lastly, of course, make your bank attorney part of the conversation. As with robots, a board is stronger than its individual parts and when working together it can accomplish amazing things. Yields flew up 7bp as durable goods orders came in mostly solid and the GOP announced the new tax plan. 62% of customers who started using a retail banking product in 2016 heard of the product from somewhere other than their bank or credit union. FNMA, FHLMC, GNMA and other government agencies own or guarantee approximately 60% of all US mortgages. FDIC data finds that from Q2 2016 to Q2 2017 the average loan portfolio for financial institutions with assets <$1B climbed 5%. The list of states with the largest decrease in the number of bank charters since 2007 is FL (-55%), WA (-51%), GA (-49%), CO (-45%) and CA (-43%). Amazon is apparently moving into industrial parts distribution - a $130B US market - chipping away at another area historically supplied by local suppliers and industry-specific distributors. A Bank Director survey finds 52% of surveyed directors do not have a board member with technology know-how. While younger directors may have more tech experience, only 30% of those surveyed reported board members under 40Ys old. FDIC data finds that from Q2 2016 to Q2 2017 the percentage of time deposits to total deposits for financial institutions with assets <$1B declined slightly from 16% to 15%.